As 2016 the year everyone on social media hates draws to a close here are 16 of my favourite news cartoons of the year include one that made it to publication and plenty that didn't. Together they tell a topical tapestry of the year of election shocks, tech and pasta sauce. 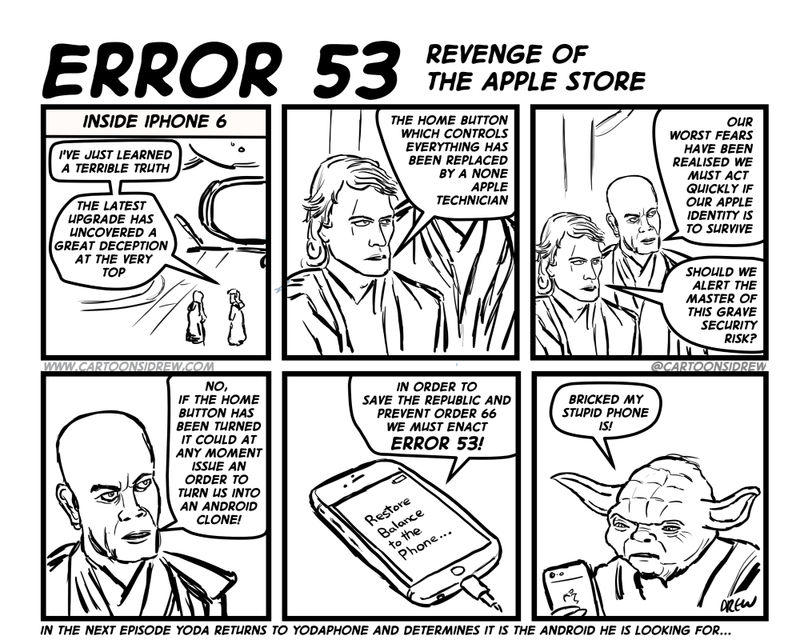 In February Apple were accused of being extra evil with Error 53 that bricked iPhones if it detected the home button had been replaced by a none Apple Technician. I include this one because it was published in Private Eye (surely the high point of my cartooning career so far), and for a brief moment it looked like David Cameron's fathers offshore dealings might bring the PM down. In the warm afterglow of getting published I attempted to tackle the most important story of the year the advice from Mars Food that we should limit our pasta sauce intake to one a week. The Scottish parliamentary elections in May seem like a more innocent time with no ridiculous candidates (except UKIP's David Coburn) and no shock results. The debates were predictable with an angry Ruth, trying to be angry Kezia, sensible Patrick Harvie and Willie Rennie. Infact the most entertaining part of the election was the BBC coverage when Brian Taylor got frustrated with the big screen technology at the start of the evening's coverage. 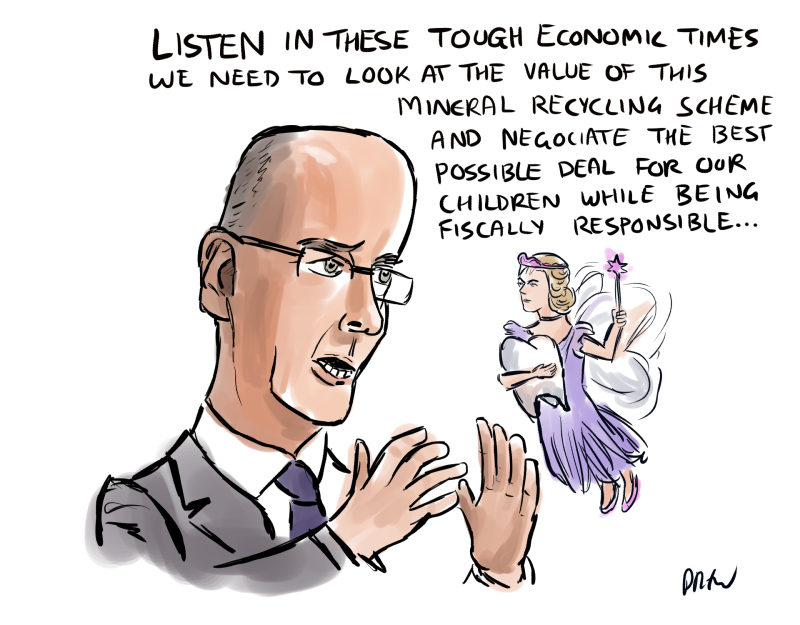 This was an off the cuff response to a John Swinney tweet about the tooth fairy which gave me a chance to caricature him. 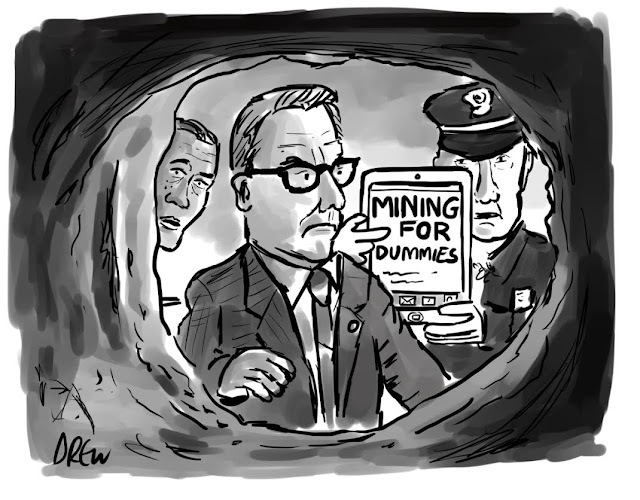 There was a story in May about proposals to allow prisoners the use of iPads in their cells which lead to this Shawshank Redemption cartoon. Tim Peake the first British ESA astronaut to board the ISS came back to earth. 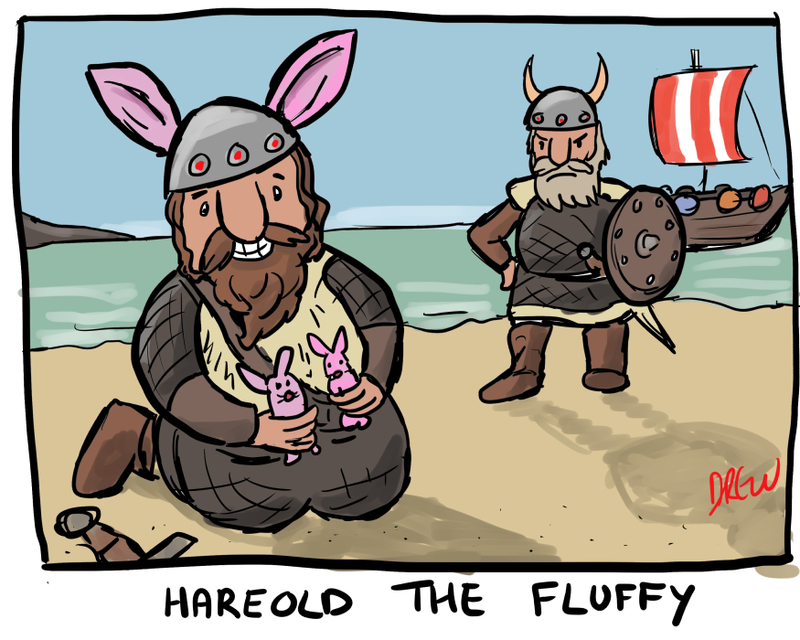 This year I drew plenty of Pokemon GO cartoons so I've picked the one I drew the day I first played it on holiday which also features a familiar lemmings gag (I go on about the lemmings myth in this blog post). I guess the most fustrated I got in 2016 was the Brexit vote and the aftermath when clearly no-one on the Leave side had a plan for what to do if they actually won. We were left wondering which of the unholy trinity of Gove, Johnson and Farage would enlighten us when instead they all went to ground for a few days. 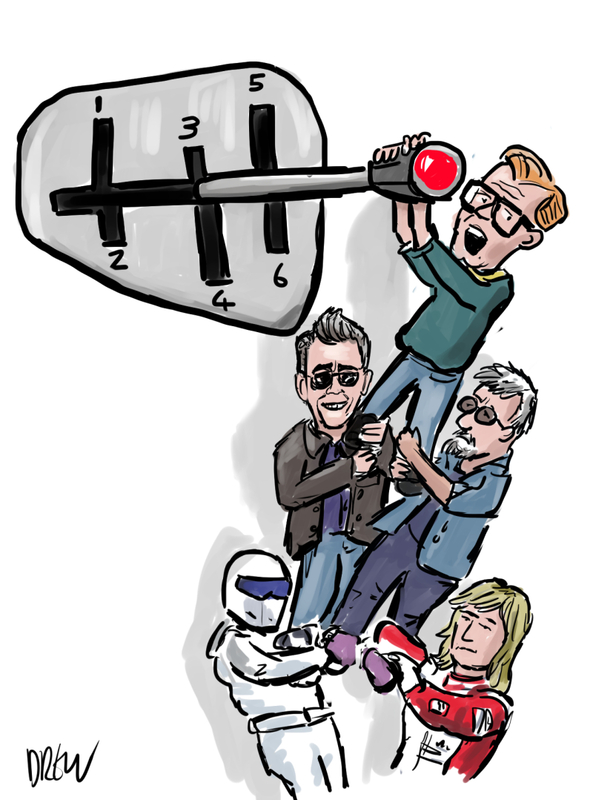 The non-Jeremy Clarkson and co version of Top Gear had a ton of presenters and Chris Evans didn't last one season before stepping down. Perhaps the most stunning act of political betrayal this year was Grove's subversion of Boris Johnson's leadership bid leaving us with May vs 'I have children' Leadsom. 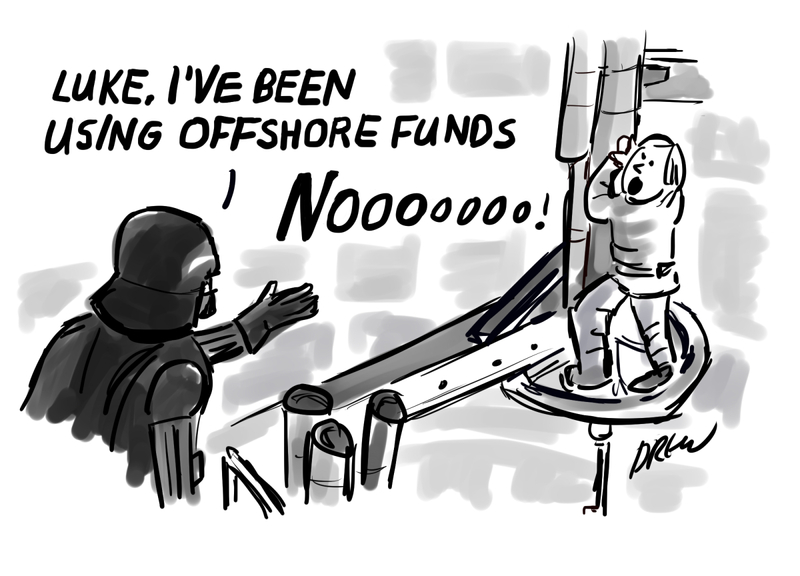 I didn't really nail it with any of my US election cartoons but this was the most fun to draw. 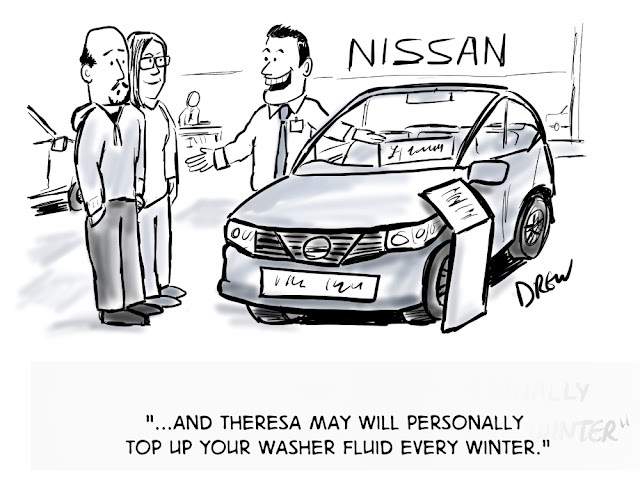 Project Fear on the Remain side said all the car manufacturers would flee these shores if we voted Leave. They didn't but someone in government had to give Nissan some 'assurances' to make them stay. 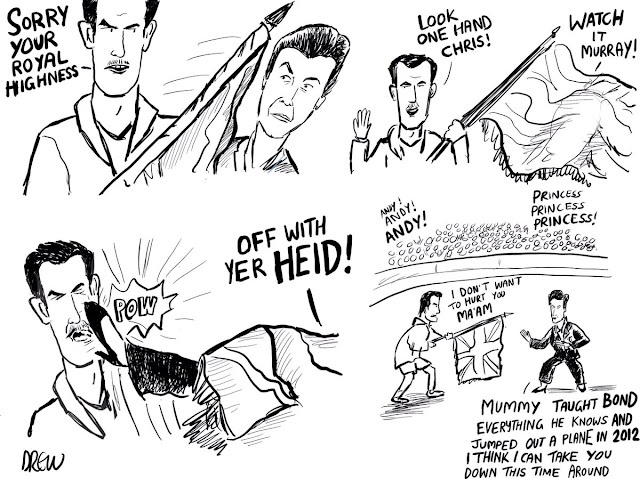 As we get to the end of Andy Murray's most successful season to date I've been looking through the Murray-thon of 17 cartoons I've drawn to see what story they tell. 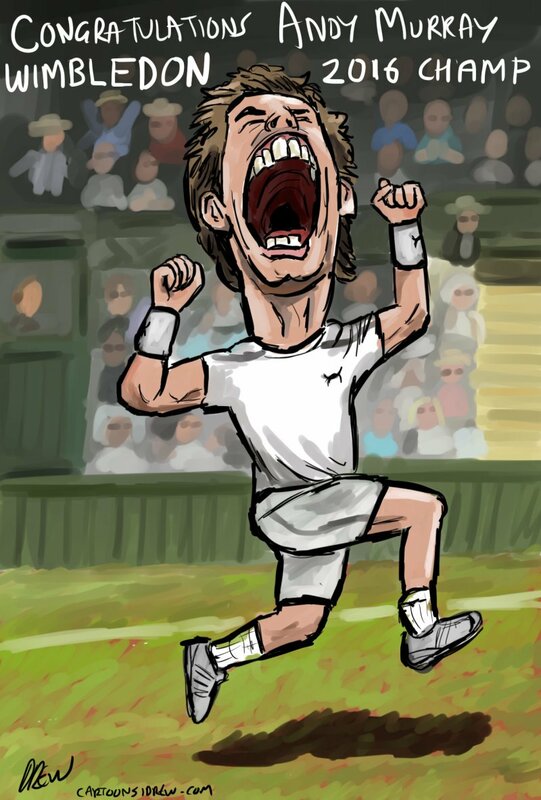 Murray beat Sam Groth in straight sets. Murray wasn't sure if he might have to leave the Australian Open early if Kim went into labour, but in the end he was able to fly home after the final. A first title in Rome for Andy Murray that was also his birthday. For the French Open I drew every one of Andy Murray's opponents. 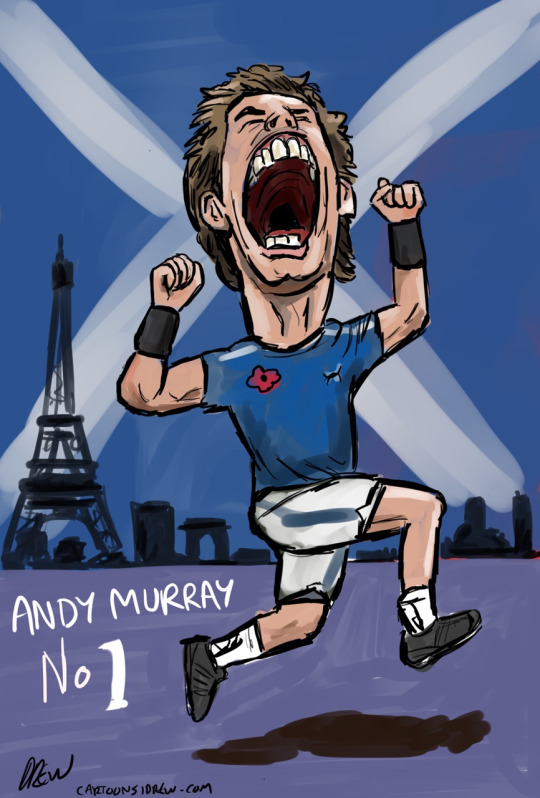 He lost to Djokovic in the final despite Murray taking the first set. 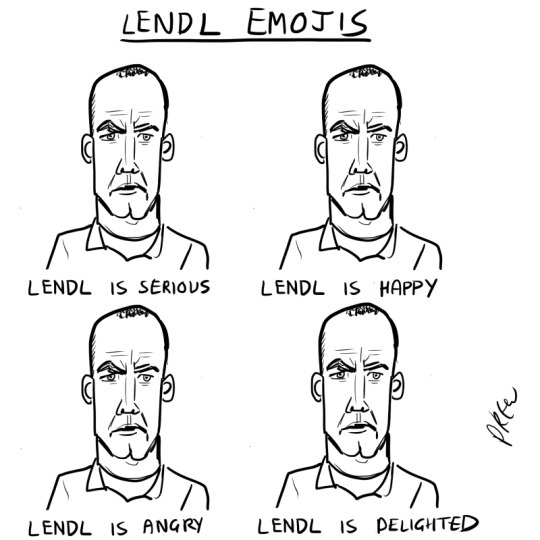 Lendl is famous for his stoic court side manner. Due to holiday plans I was actually in the Legoland shop when Andy Murray clinched his second Wimbledon victory over Raonic. 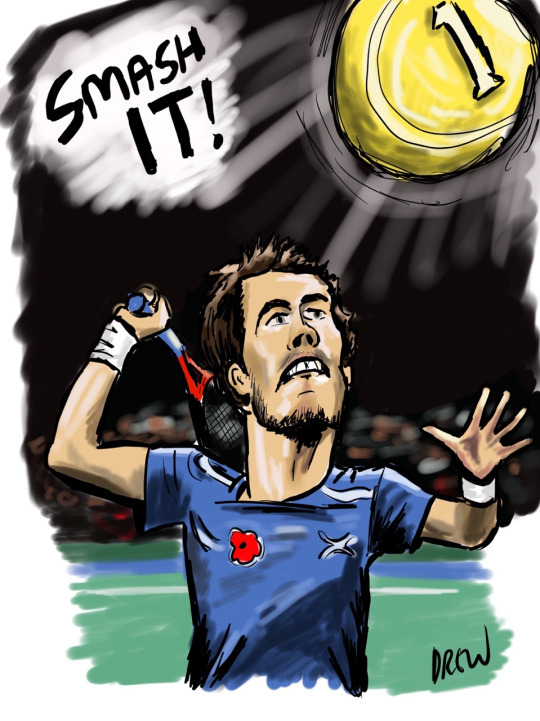 My victory cartoon was actually one I had drawn for an expected French Open victory for which I changed the background. Andy Murray gets a second Gold Medal against Del Potro. He wins 6-2 6-3 6-3 but loses to Kei Nishikori in the quarter finals. 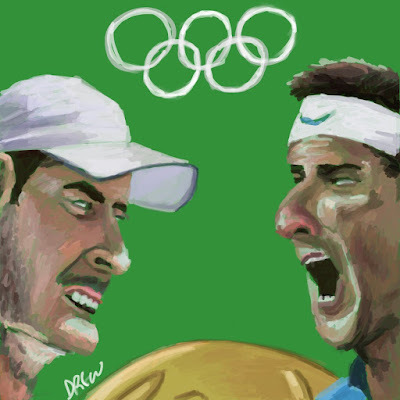 Drawn after Andy beat John Isner in the quarter finals needing one more victory to get about Djokovic in the rankings. 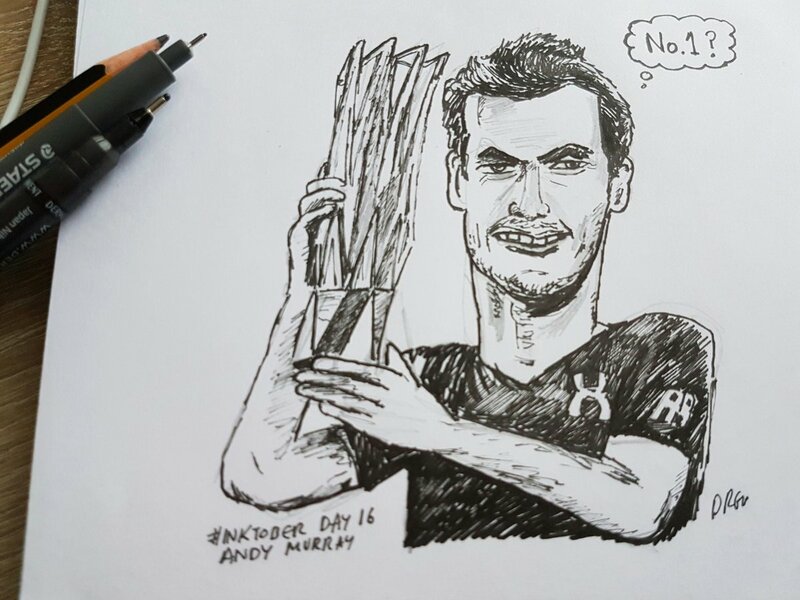 In the semi-finals Raonic withdrew through injury and Murray clinched the number 1 spot before going on to add the Paris Masters to his trophy cabinet. That picture looks familiar. I enjoy learning new facts. 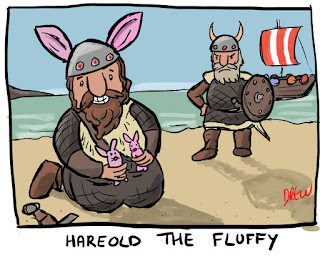 While researching cartoons you often learn interesting things like the origins of the lemmings myth. The colour collective this week was using the colour magenta which a quick google revealed was named after the 1859 battle of Magenta in the Second War of Italian Independence (previously it was called fushsine). Magenta isn't in the visible spectrum, it isn't there in the rainbow when we sing 'Red, Yellow, and Green and Blue...'. It is an extra-spectral colour (together with pink, beige and anything on the greyscale). There is no magenta light which can lead to clickbait titles like 'Magenta doesn't exist!' 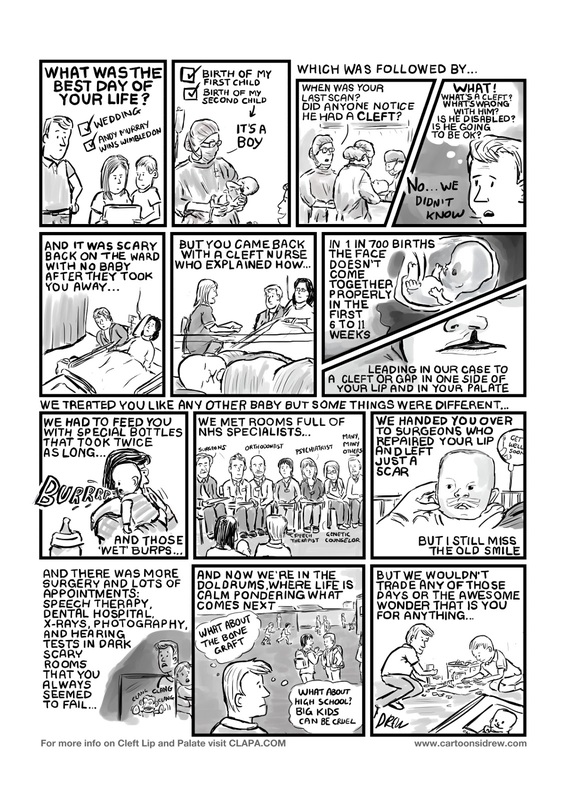 or 'Magenta isn't a colour', given given you can see it there is more nuance than that. The colour magenta is composed in your brain using inputs from your eyes which have cone receptors for Red, Blue and Green. Magenta isn't one colour it's a mixture in our brains of Red, Blue and no Green so it really is a pigment of our imagination and only perceived psychologically. However you can argue that all colour is perceived psychologically which explains colour blindness and animals with different perception (the Mantis Shrimp has 12 colour receptors to our 3). 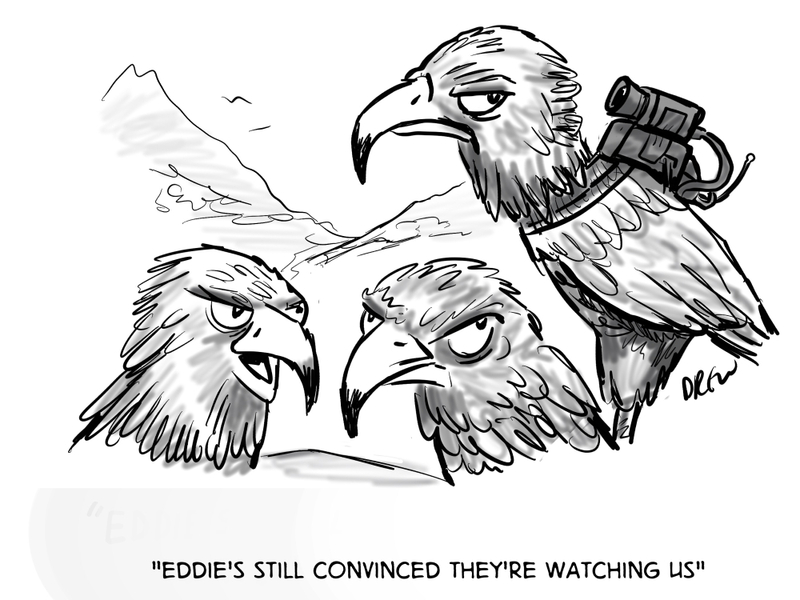 All of which lead to this cartoon about camouflage. 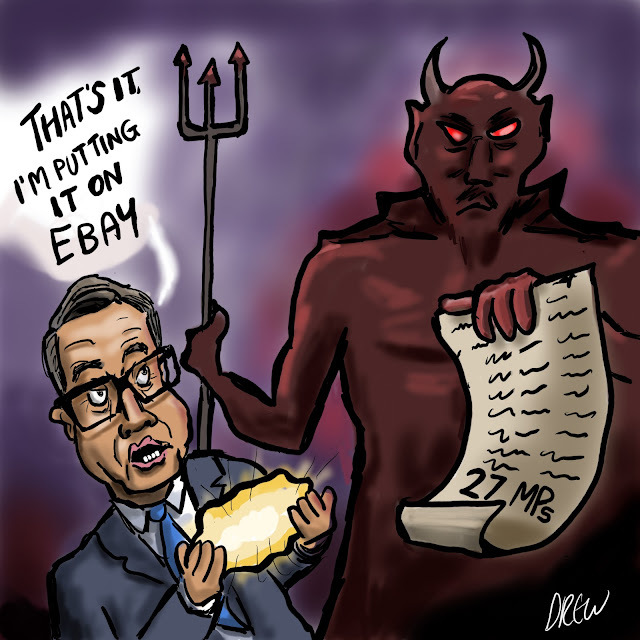 The funny thing on reflection about the Internet world is that you can spend hours on what you think is a great masterpiece only to have it sink away unnoticed in the great stream of social media or you can doodle a lucky 15 minute sketch (it may have been even quicker than that) and it gets more attention than you imagine. 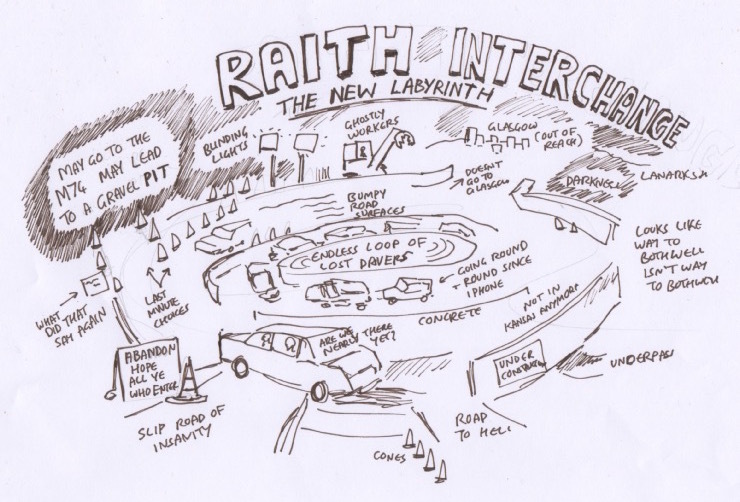 However I am still avoiding the Raith Interchange until people tell me it is all sorted. 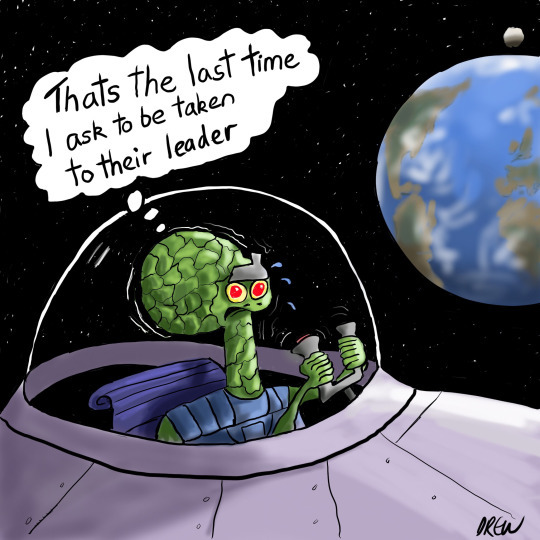 I'm quite pleased with this gag from #ShapeChallenge as it is another one done on iPad/Procreate/Pencil combo. So England v Russia Euro 2016 for England in Marseille where the fans had been involved in clashes for three days, and following a victory for Wales who showed that British teams can win their opening matches the England team performed quite well. 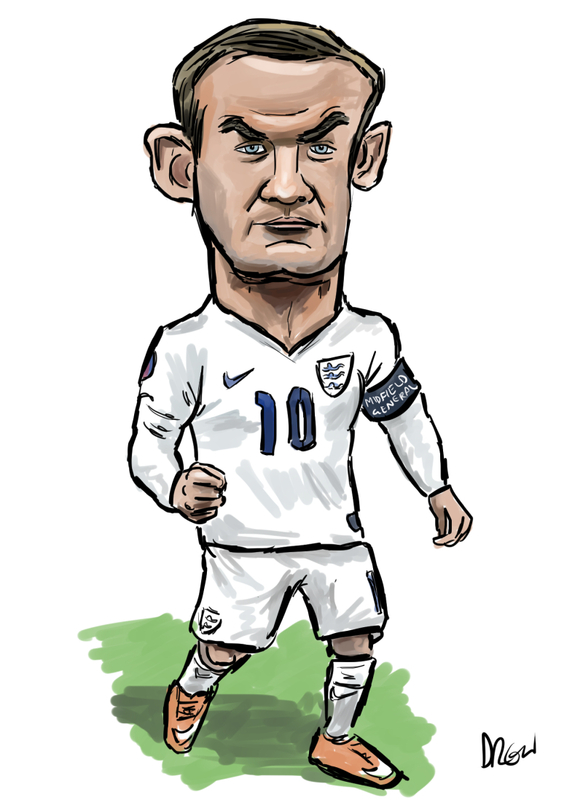 With the veteran Wayne Rooney now withdrawn into midfield as a midfield general (drawn above) they were making lots of chances that unfortunately no-one managed to get onto the end of. It was all potential, pressure and no goals in the first half and in the second half Russia came more into it until Dier scored from a free kick and Roy Hodgson hauled off Rooney and Sterling for Wilshere and Milner as we looked to see out our victory. With Russia it is never so simple and in the 91st minute they scored an equaliser with one of their few attacks. 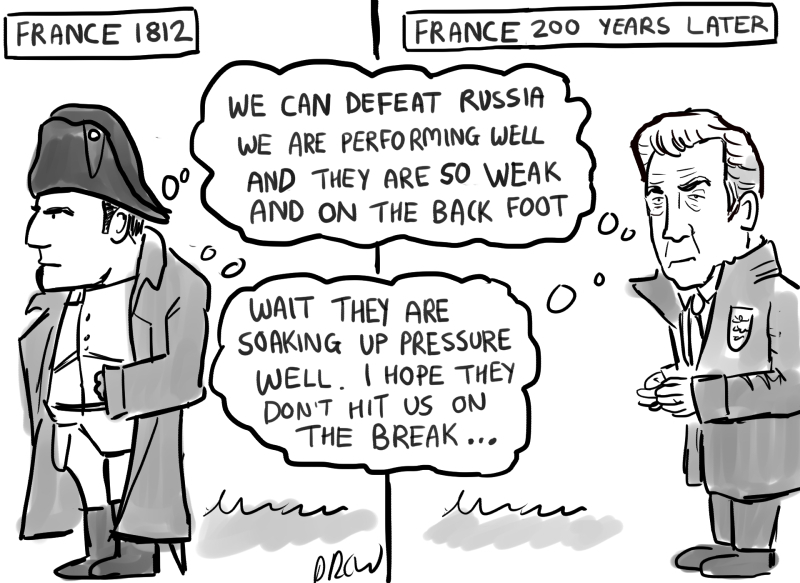 In the aftermath where a draw felt like a defeat I drew this cartoon showing parallels between 1812 and now (although whether Borodino which was not the clear victory Napoleon was looking for exactly equates to a 1-1 draw is debatable). 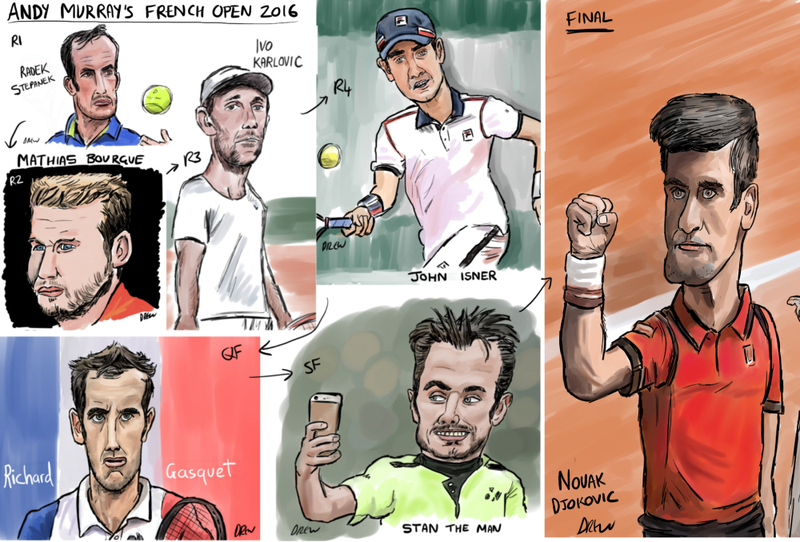 For major sporting tournaments I sometimes try and give myself a challenge like drawing every member of the GB Davis Cup team last year. Actually what really happens is I start something for fun and then find myself having to finish the set much like Novak Djokovic found himself trying to complete his set of Grand Slams at the French Open this year. 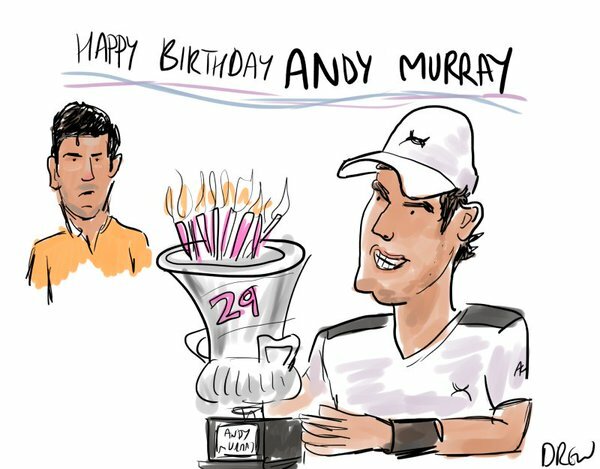 Most of the time when I follow tennis it is either Davis Cup, Andy Murray or Wimbledon but this year I could watch the French Open on TV so I thought I would keep track of how Andy Murray was doing after his impressive win in Rome over Djokovic on clay when I drew this quick cartoon (it was also his 29th birthday). The big news going into the French Open apart from Djokovic's desire to win it, and Andy Murray's form was Federer pulling out of his first grand slam in 17 years due to injury. Round 1 - Radek Stepanek. 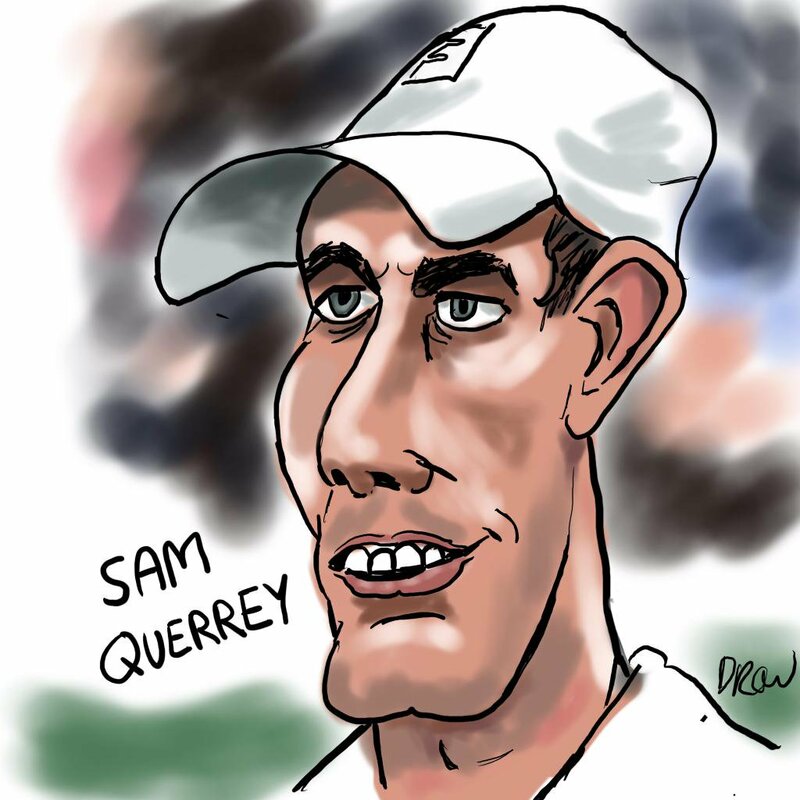 An old man in tennis terms at 37 Murray was two points away from leaving the tournament in the first round before he turned it around to win in 5 sets. Round 2 - Mathias Bourgue. After the wily veteran who fought his way into the French Open through the qualifiers we thought the young wild card Frenchman Mathias Bourgue would be a much easier and he wasn't taking Andy to five sets. 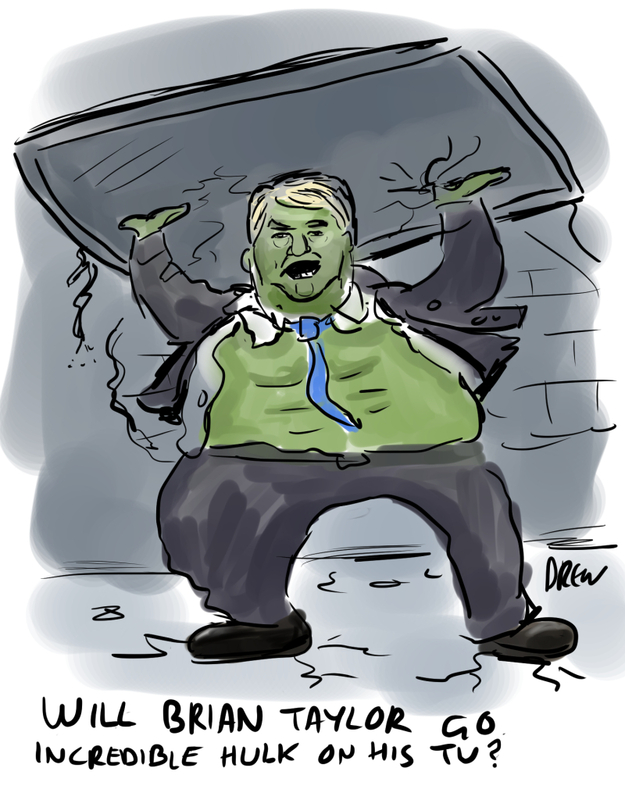 I originally drew him as a Star Trek Borg so I could use the tagline 'Resistance is Futile'. Round 4 - John Isner. The big serving American didn't give Andy Murray too many problems either and suddenly with the fixture congestion due to rain affecting Djokovic's side of the draw it was looking better for Andy. 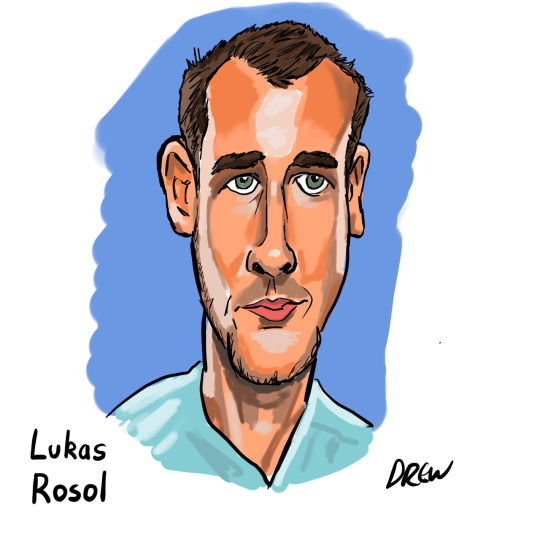 Quarter Finals - Richard Gasquet. The last remaining Frenchman Richard Gasquet looked like a tricky test and took a lead in the first set and took the second set to a tie break before collapsing quite spectacularly in the third set to get "bagelled" by Murray (6-0) before succumbing in the forth. I was quite pleased I could make his outfit blend into the flag in the drawing. 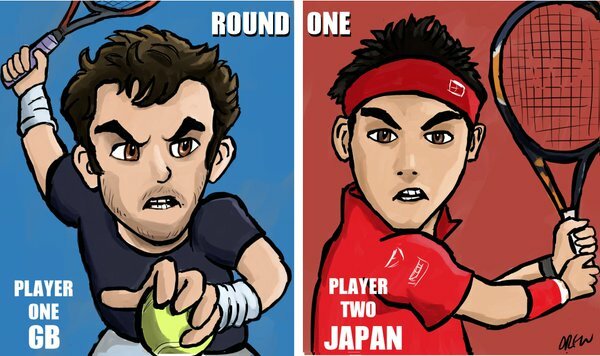 Semi Finals - Stan Wawrinka. 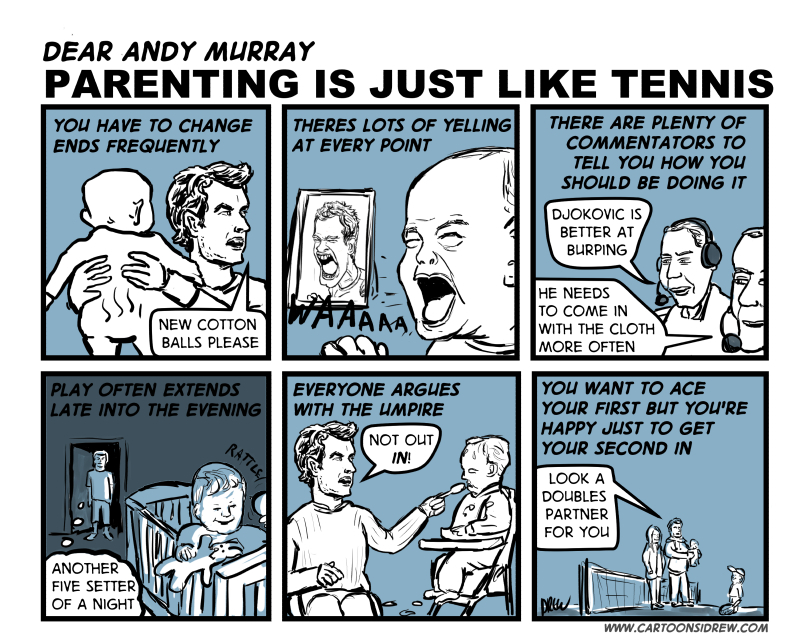 Perhaps Andy Murray's finest hour in the tournament was to despatch reigning champion Swiss Stan Wawrinka in fours sets playing some fine tennis on clay. 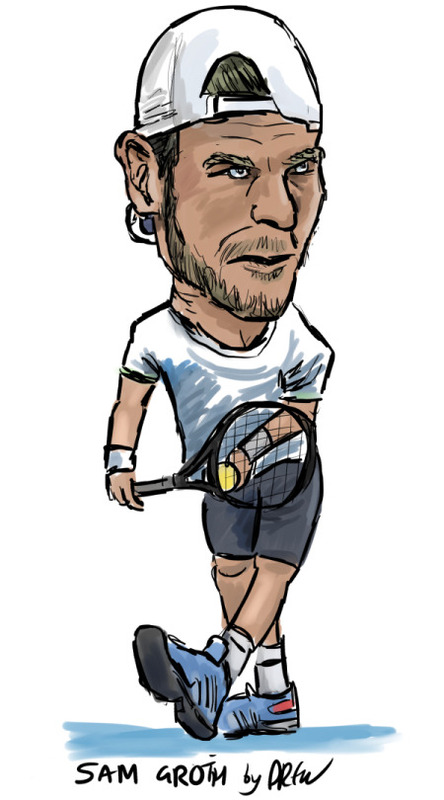 I liked Stan the Man's yellow outfit and the way he was always taking selfies at the end of his matches so I tried to incorporate these into his caricature. The Final - Novak Djokovic. 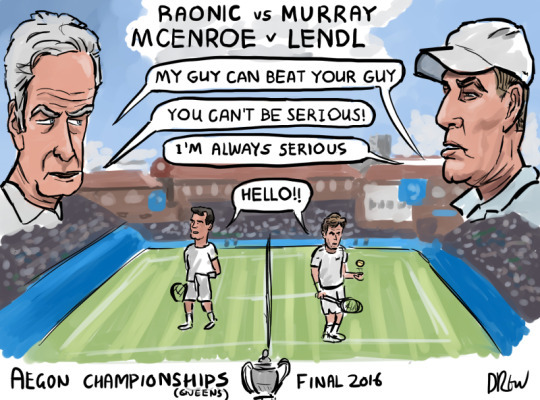 It was perhaps inevitable it would come down to these two and while the betting odds were clearly in Novak's favour with his experience of winning many grand slams, part of you couldn't help wonder if Andy Murray would continue the tradition of other players frustrating him at the French Open. He lost the opening game to love, but then went on a fabulous winning streak that broke Djokovic twice and netted him the first set. When he almost broke Djokovic in the first game of the second set it was still looking good but Djokovic stepped up a gear and won the second the third sets 6-4. The fourth set may have been a chance for a Murray comeback but he was broken twice and his late rally only put off the inevitable when Djokovic won 6-4 to claim the only Grand Slam he hadn't won. The other talking points that spawn cartoons were the weather and the outfits. The lack of a roof (the Australian Open has three, Wimbledon one and the US Open will get one this year) coupled with some pretty abysmal weather for northern France meant a lot of play was rained off with one day being lost completely and other days where very little play occurred. 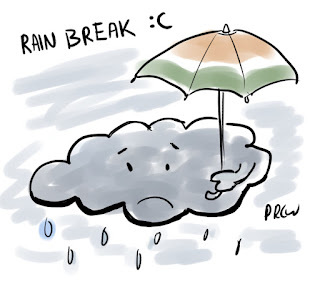 Despite this they did get through the schedule in time to have the men's final on the second Sunday but with some forecasts this wasn't looking likely. Secondly Adidas players were wearing a funky black and white zebra pattern outfit based on the dazzle camouflage of WW2 allied shipping. 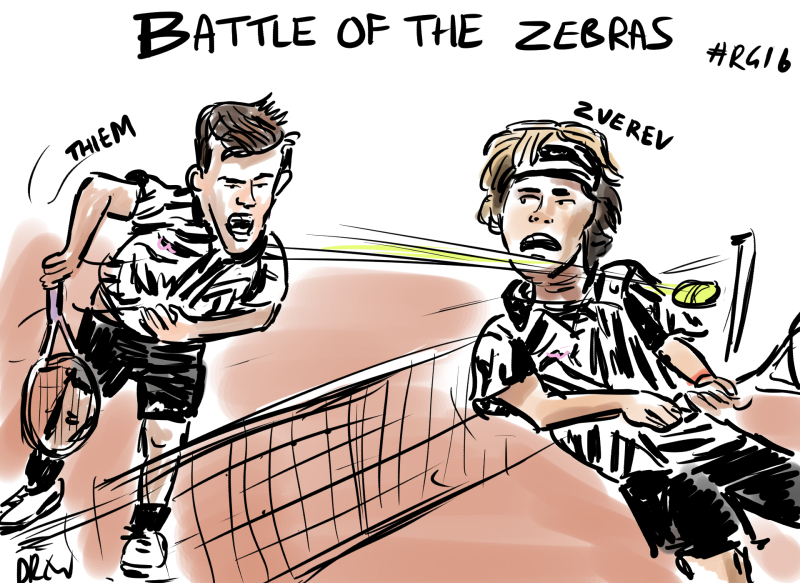 I drew a picture from one of the battle of the Zebras when two adidas players Thiem and Zverev were battling it out in the third round. It even got a retweet from the Roland Garros twitter account. 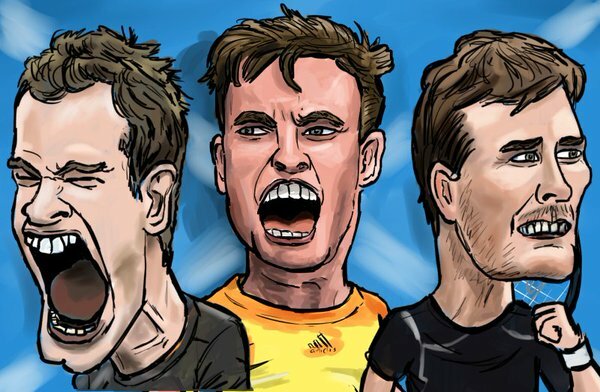 @cartoonsidrew Taking adidas/Thiem/Zverev/RG fan art to another level. Très bon! So a wet French Open was good for the unstoppable Novak Djokovic and nearly great for Andy Murray. Now the grass season is upon us and in a month or so it will be Wimbledon. No idea if I will do anymore for that given it falls in a busier time of year for me. 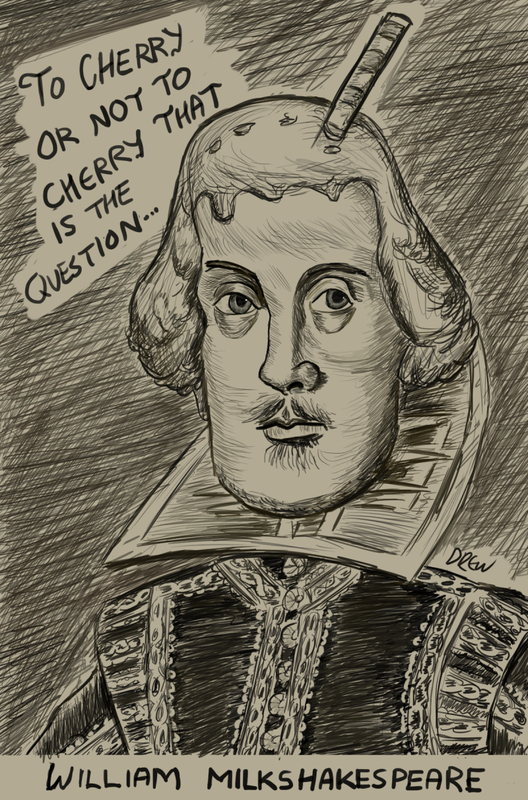 Terrible pun I know but since its the #Shakespeare400 celebrations and Twitter is awash with Shakespeare jokes I had to find a different angle for the Thursday #PortraitChallenge. 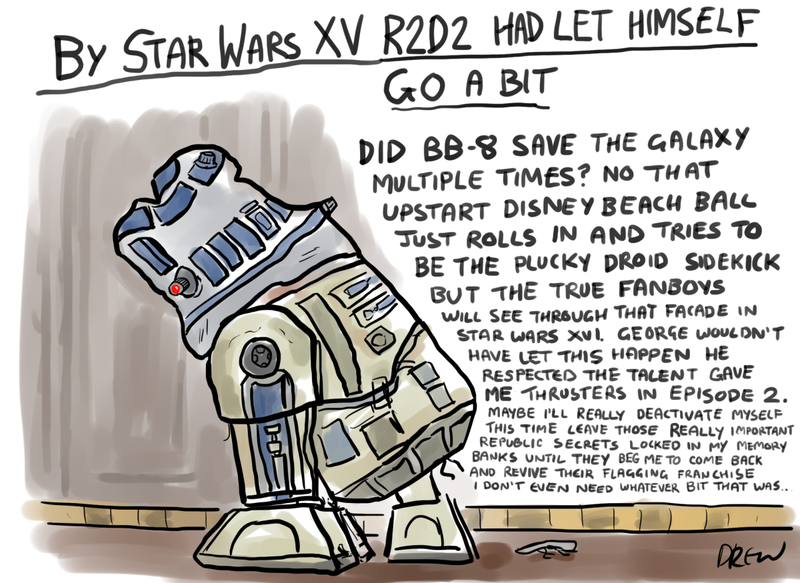 Usually it's all about the drawing but when I started this #ShapeChallenge about a ranting ageing R2D2 I almost couldn't fit everything on the one panel. Indeed I cut entire sections in my head about how he took down two battle droids, and how Princess Leia entrusted him with the secret plans to the death star without which there wouldn't have been a Star Wars in the first place. Recently I have started taking part in Twitter #ShapeChallenge which is one of Sarah McIntyre's Virtual Studio challenges. I quite liked this Shape and made it into a fierce Party Balloon viking. 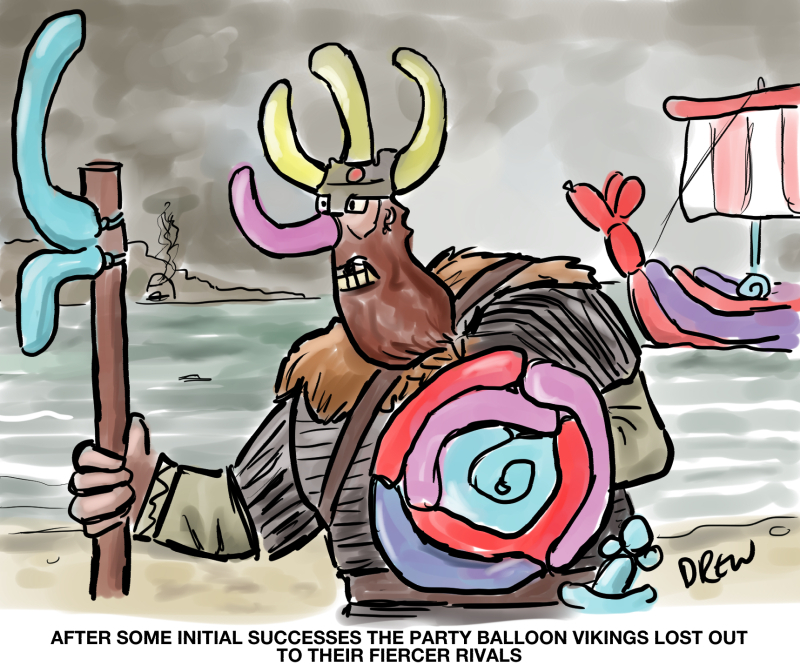 Unfortunately we don't know much about the Party Ballon Vikings due to the way their weapons and armour were popped and flew away meaning their ancient art of balloon animal making was lost for centuries. 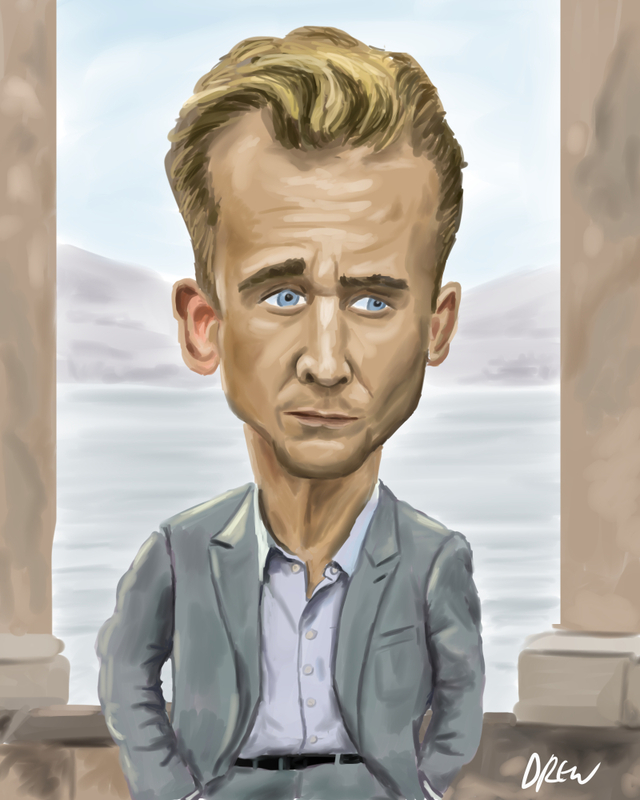 Really enjoying the BBC adaption of Le Carre's The Night Manager starting Tom Hiddleston as Jonathan Pine so I drew this caricature. The Spring 2016 #AppleEvent unveiled a smaller iPhone the iPhone SE which is 4 inch screen and the smaller iPad Pro. 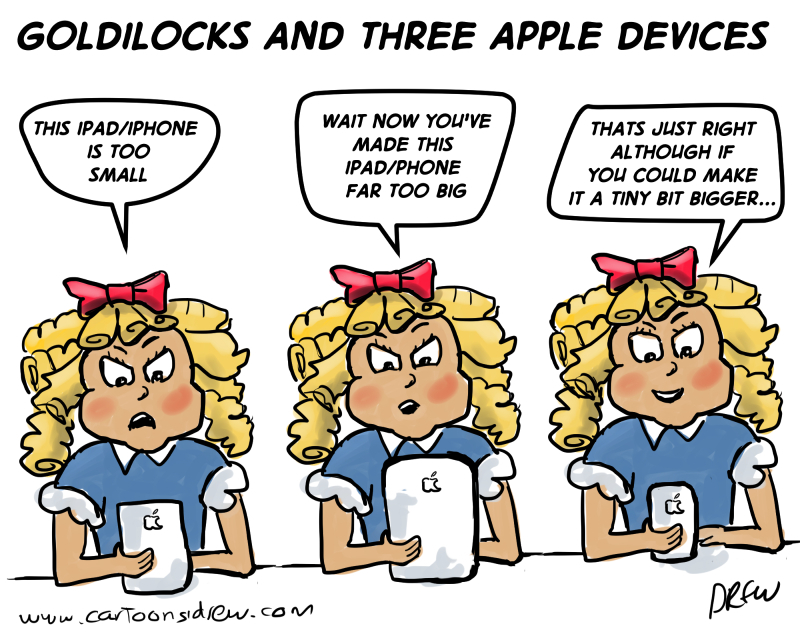 Last time round I really wanted a big iPad Pro now I have to avoid the temptation of the most cost effective smaller one. 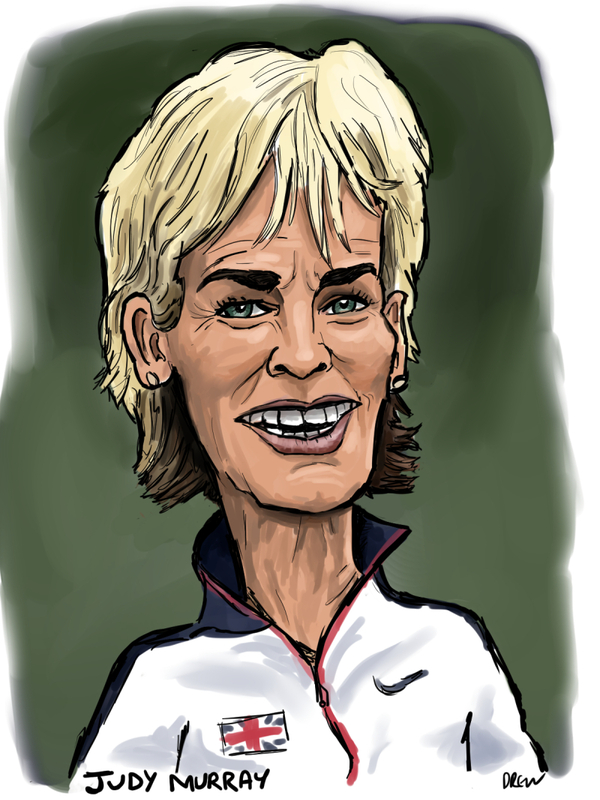 On Mothers Day eve I drew one of Scotland's most famous mothers Judy Murray who is a tennis coach and the team captain of the GB Fed Cup team and who also does lots of work promoting tennis in the UK as well as being the proud mum of Jamie and Andy Murray. Happy Super Tuesday the only famous Tuesday not about pancakes whose significant role in the presidential primaries I was unaware of until I watched later seasons of The West Wing. 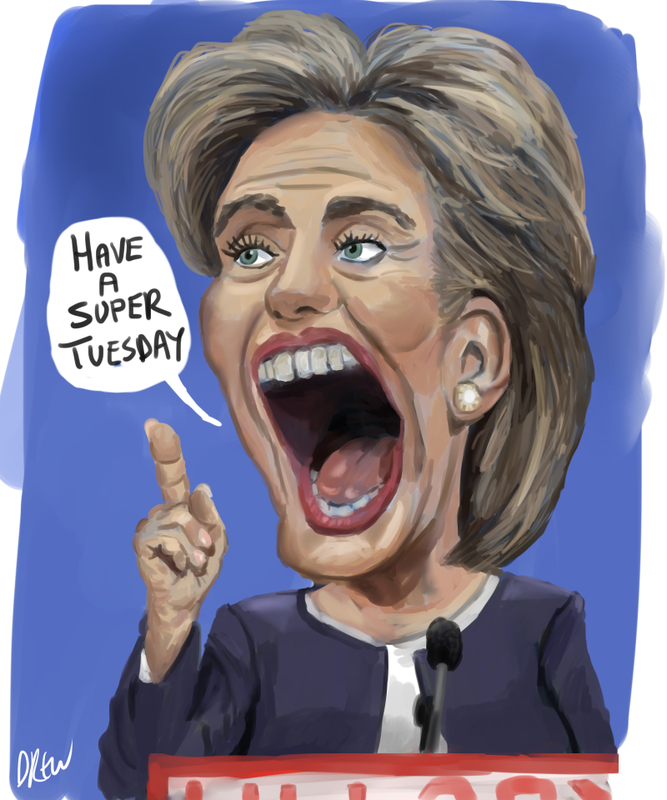 The only way I could trump an earlier competition caricature of Donald was by caricaturing Hillary Clinton the most likely democratic candidate according to pollsters who are never ever wrong. Please note that this does not represent any official endorsement of any US presidential candidate as I am still smarting from your countries rejection of over lovely monarch several centuries ago. 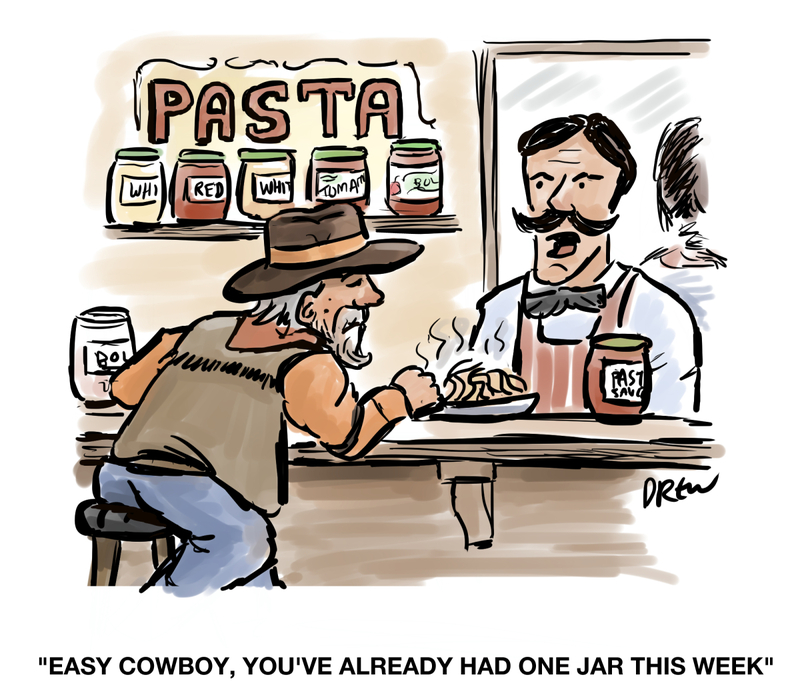 If I were to vote I would want Jeb Bartlett or Harrison Ford. My spooky prediction from 2011 is that not only would Hillary win the election of 2016 but during her inauguration the aliens from Independence Day would return to ruin her big moment.